On Sunday during Passover, Allen and I went to the Israel Museum to view the special exhibition ,”Pharaoh in Canaan.” The exhibition focuses on the second millennium BCE, the period during which Canaanites migrated and settled in the Nile Delta area of Egypt and the Egyptians conquered and ruled much of the land of Canaan. Archaeologists refer to the time as the middle and late bronze ages, the time in which Jacob and Moses lived. I had gone through the exhibit a week earlier with my nine-year old granddaughter Yocheved. Her approach to museums is somewhat different from mine. She moves quickly, sometimes stopping to look at an artifact. Letting her use my camera slowed her down a little as she stopped to take multiple photos of things she found interesting. Thus, I ended up with several photos of anthropoid sarcophagus lids, some of which are in focus. My approach to museums is slower paced. I read the labels on the artifacts and the informative signs. I look carefully at the artifacts, comparing them. And sometimes I take a photo or two of something I find particularly interesting, if photos are allowed. 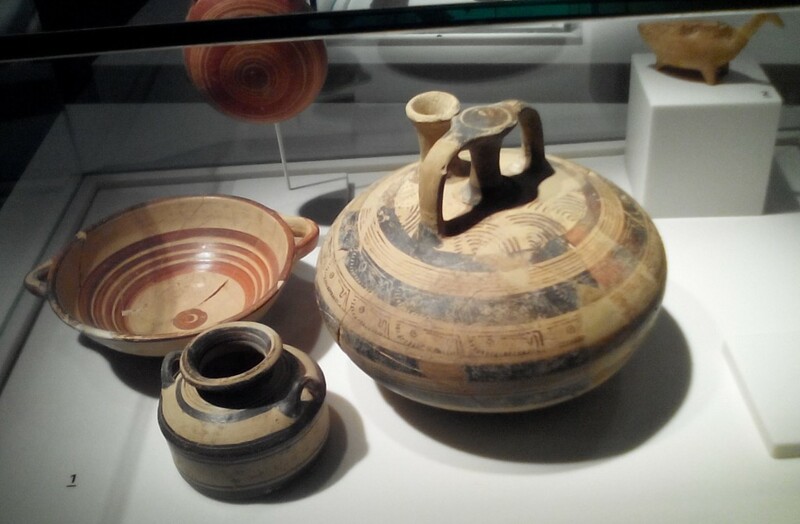 Flash photos are often forbidden because the light can damage some ancient artifacts. One exhibit I found particularly lovely was a small statue of Pharaoh Akhenaton carved from yellow limestone. In the photos advertising the exhibit, the statue looks large and golden. Surprisingly, it is only about two feet high. The lighting makes the yellow limestone look as if it is gold. What I like about this statue is that it makes him look more human than most statues of Pharaohs. I wonder, however, what he thought of the sculptor’s showing his pot belly. Pharaoh and his wife Nefertiti. Unfortunately, all that remains of Nefertiti is her left arm draped gracefully around Akhenaton’s back. From the back, you can see he is leaning slightly towards her, a depiction of marital intimacy not often shown in royal portraits. 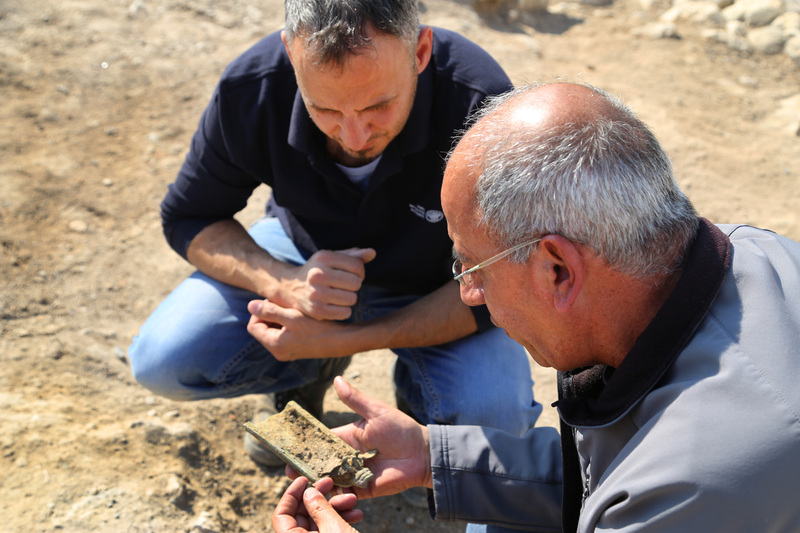 Two cases were full of gold jewelry found in archeological digs in Israel. Although the rings did not appeal to me, many of the earrings were similar to ones you can see in today’s jewelres’shops. It’s strange to think that styles over four thousand years old would still be appealing, but many of the earring I would enjoy wearing myself.